County and Township Map of Arizona and New Mexico. 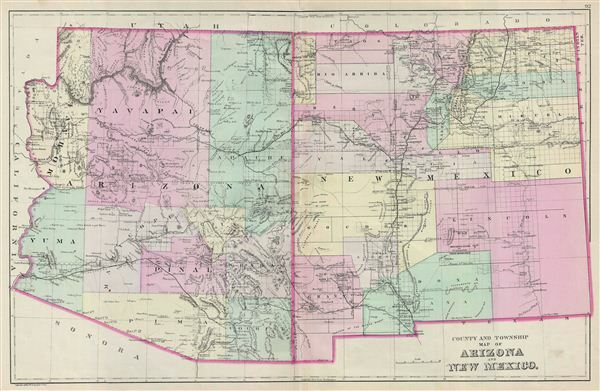 A fine example of William M. Bradley's 1887 map of Arizona and New Mexico. The map covers both Arizona and New Mexico in excellent detail along with parts of neighboring California, Nevada, Utah and Colorado. Bradley further delineates survey grids referencing the work of the U.S. Land Survey. Also identified are Snowflake, St. John and Mesa, the sites for major Mormon settlements. Various cities, towns, rivers, mountain peaks, railroads, American Indian reservations, military reservations, and an assortment of additional topographical details are also noted. Map is color coded according to territorial and political boundaries with elevation rendered by hachure. Copyrighted 1887 by Wm. M. Bradley & Bro., as plate no. 92 in the 1890 edition of Mitchell's New General Atlas. Bradley, Garretson & Co. (fl. c. 1880 - 1900) were prominent cartographic publishers active in the later part of the 19th century. Bradley acquired Samuel Augustus Mitchell Junior's atlas plates in the late 1880s which he used to publish his own version of Mitchell's atlas. The firm had offices both in Philadelphia, at 66 North Fourth Street, and in Brantford, Ontario. Very good. Blank on verso. Original centerfold. Small verso repair along centerfold.